Who are the black Irish of the Caribbean? 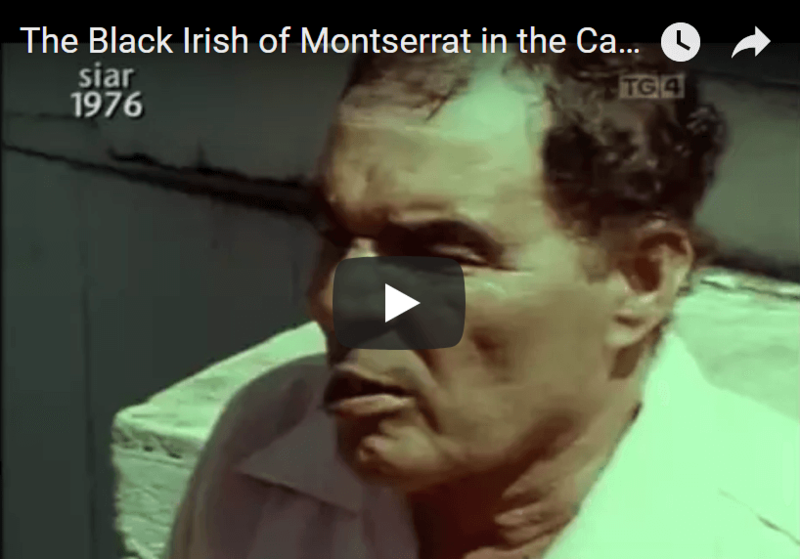 We have compiled a selection of videos and facts about the black Irish of Montserrat. These videos amaze us; we featured one of these videos on our Facebook page a few months ago, and your reaction said it all. Nearly 300 families of the 1,600 listed in the phone book have Irish surnames. Island historians say they are unsure of how many Irish Africans live on the island. Back in 1678, more than half of the island’s population was Irish. Marriages among the Irish and African slaves and the mingling of their diverse heritages produced a unique culture where racism could never arise. Guinness signs and Guinness drinkers are as common on Montserrat as they are in Ireland. St. Patrick`s Day is celebrated on Montserrat not only to commemorate the island`s Irish history but also to remember the March 1768 slave rebellion. On this day, visitors passports are even stamped with a shamrock. It wasn’t until 1971 that the rest of the world began to take notice of this particular bit of colonial history. We now also have a brand new Irish Heritage facebook page which you can visit and like here. The first video below is presented by our now President of Ireland Michael D Higgins, back when he was a lecturer at UCC(University College Cork). Filmed all the way back in 1986. The film tells the story of Ireland’s involvement in slavery, a St. Patrick’s Day revolt when slaves and their Irish overseers rose against their English masters, the culture and music of the island. Incredible footage! This next video is just as amazing. Filmed in 1976 by TG4 this video tells a different story about how many of the Irish were forcibly deported there when the English had conquered Ireland with the help of the famous military leader known as all over Cromwell. It was at this time that all royal and Catholic-owned land was confiscated and given to English and Scottish settlers. Many of the old Irish and Catholic were either massacred or as in this case forcibly moved to a faraway island. This video tells the story of how Montserrat came to celebrate St. Patrick’s with an entire week full of events. The first minute or two shows the current St Patricks day celebrations; we do not agree that the Irish were the “masters” as they outline in this video. It is good to see that despite all that has happened, the Montserrat spirit has prevailed, that after all that has happened love has conquered. There is many more articles and posts on the Black Irish; a quick Google will bring up some fascinating posts. If you found this story as incredible as we did please share it with your family or friends. Thank you for reading! “The Black Irish of Montserrat”Black Irish of the CaribbeanKinsaleMontserratNot Co. Cork 1976The Black Irish of Montserrat Irish accents in the Caribbean .